The first decade of the 21st century began with business journalists facing criticism for their boosterish coverage of companies during the tech bubble and ended with many of the same reporters facing more criticism for failing to warn consumers about the current economic crisis. In between, the world of business journalism underwent dramatic changes that make the field only vaguely similar to what it looked like back on Jan. 1, 2000. Talking Biz News believes the following 10 events — ranked in order of importance — were the most important to business journalism during the past decade. If you’d like to nominate another event, please post a comment. 1. The demise of the daily business section: At the beginning of the decade, standalone business sections in metro newspapers across the country were the primary source of news for those seeking information about business, the markets and the economy. As 2009 closes, they’re now an afterthought. Many of these papers have only themselves to blame — the cutting of printed stock listings and the downsizing of business news staffs have cut the quality and quantity of business news they provide. 2. 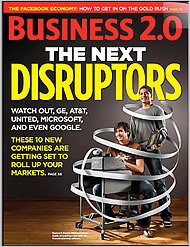 The biz magazine shakeout: Goodbye Business 2.0, one of the hippest business magazines ever printed. Hello, and goodbye, to Conde Nast Portfolio. So long, Fortune Small Business and BusinessWeek SmallBiz. In addition, Inc., Fast Company and BusinessWeek were sold to new owners, Fortune cut its printed issues by 33 percent and Forbes sold a minority stake of itself. None have been able to find a new formula for success. 3. The rise of Bloomberg News: At the beginning of the decade, Bloomberg was simply another wire service that competed against the AP, Reuters, Dow Jones Newswires and the now-defunct Bridge News. Now, it has the largest staff of business journalists anywhere. It owns BusinessWeek magazine, and it’s overhauling its TV operations to compete with CNBC and Fox Business Network. The contest for business news dominance now appears to be a two-horse race between Bloomberg and Dow Jones. 4. Dow Jones sale to News Corp.: Rupert Murdoch added the parent company of The Wall Street Journal, Barron’s, Marketwatch.com and Dow Jones Newswires in 2007 to his far-flung media operations. Along with the Fox Business Network, News Corp. now has a presence in delivering business news in every major platform. The Journal has continued to grow its subscription base and has led the pack in requesting consumers pay for business news online. 5. Cable biz news wars: After CNNfn went off the air in 2004, CNBC had the cable business news market to itself for the next three years, until 2007 when the Fox Business Network was launched. Amid criticism that it was too bullish at the beginning of the decade and too defensive of Wall Street at the end of the decade, CNBC continued to dominate business news on TV. 6. Lessons learned: Yes, business journalism was asleep at the wheel in failing to provide adequate coverage of tech, Internet and telecom companies in the first part of the decade. But many biz reporters learned their lesson, and the coverage in the latter part of the decade about the housing bubble and Wall Street problems was much better. And I don’t buy the argument that financial journalism should have warned consumers what was coming; we are not fortune tellers. 7. KHOU-TV’s coverage of bad tires: This was the 2000 coverage of the Firestone problems on Ford Explorers that led to dozens of deaths, and it was a stark reminder that the best business journalism is investigative and questions companies, searching for answers when a company stonewalls. It led to an overall more adversarial approach to business journalism for the rest of the decade. 8. Jon Stewart’s takedown of Jim Cramer: Forget the back and forth between the two combatants here. Simply put, “The Daily Show” hosts montage of bad calls by Cramer put into focus what every serious business journalist knows: You don’t ever predict something, particularly involving investments or money, in print or on the air. Sadly, Cramer’s not the only one who does this. 9. Pulitzer winners abound: From the 2002 win by Gretchen Morgenson of the New York Times for her coverage of Wall Street to the 2008 win by Washington Post business columnist Steve Pearlstein and the 2009 win by Alexandra Berzon of the Las Vegas Sun, the Pulitzer committee recognized that business journalism was prescient and performed its watchdog role. 10. New delivery systems: iPhones and Blackberries now act as a transmitter of The Wall Street Journal and other major business media outlets. Twitter sends headlines of breaking news. Kindles and Sony Readers can do all and more. The newspaper is not dead as a medium of business news, but it now has more competition from a variety of options. Super list. The shortsightedness of newspapers in chipping away and/or cutting standalone sections at a time when business news is so important ranks as one of the dumbest moves of all times. And I agree that business journalists shouldn’t be offering mea culpas on the economic meltdown when (see your #1) newspapers have given up on investing in hard-hitting, thoughtful business journalism. I agree that the decade was marked by the rise of Bloomberg, but you’re leaving out Thomson Reuters, which is still very much in the game. Previous story Why isn't my paper carrying more business coverage?